The Nex Flow™ user-friendly PLC flow control system (PLCFC) for compressed air is truly advanced and uses the most modern technology available today and can be used as a standalone unit or interfaced with other automated systems. The PLCFC is a PLC based system – not just a simple timer. 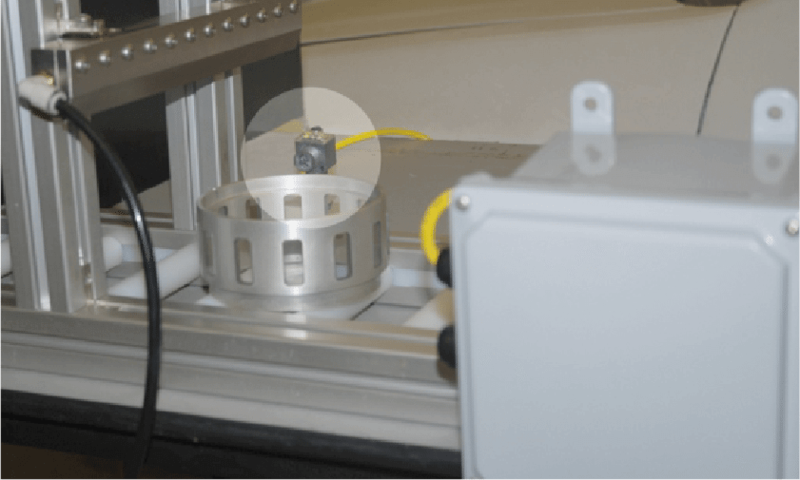 The PLCFC combines a photoelectric sensor to turn on the air when the target passes the sensor and to turn off the air when it leaves the sensor. (The unit is set to have a 2 second delay after it leaves the sensor but turns on instantaneously when it sees the target). We can supply an optional timer if the customer wants to set the unit to turn off based on time rather than using the sensor to turn it off. We can control not only solenoid valves for on-off, but can control any electrical devices such as motors, fans, conveyor motors that carry the parts, etc. Also, our systems which come complete with one sensor, can operate with up to eight sensors (not just optical, but proximity switches and other kinds of sensing devices) for multiple independent tasks. Each task can be programmed and Nex Flow™ can offer the service of special programming according to customer needs. In addition, you have a choice of any one of two types of sensors –a 500 mm sensing range diffuse type (no reflector needed) or a 3000 mm sensing range reflector type . Other special sensors can be supplied on request like laser sensors. All this comes in a simple package at a competitive cost! The system can be programmed to suit any special application the customer may have for blow-off systems, other automation applications, or it can be tied into existing automated systems. It is easily connected for either 110V or 220V making it suitable for applications around the world. 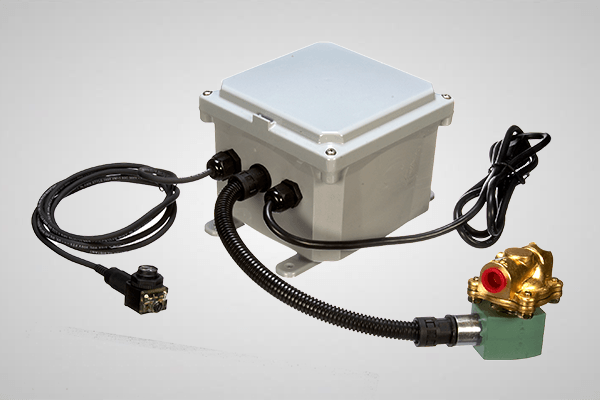 Designed for use in industrial environments, including wet ones, this rugged unit is simple to install in tight places – flexible, easy to use, and adaptable. 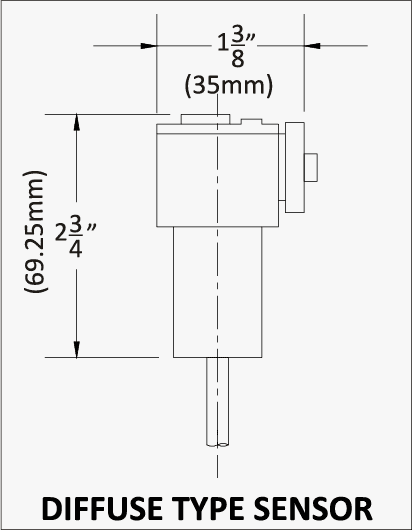 PLCFC APPLICATION – Compressed air use is reduced by 70% when utilizing the PLCFC. Two Air Amplifiers used to cool castings only operate when the sensor “SEES” the castings and shuts them off two seconds after the castings are cooled. No timers need to be set. Air Amplifiers cool the castings as they move along a conveyor. The sensor detects the part to turn on the amplifiers. 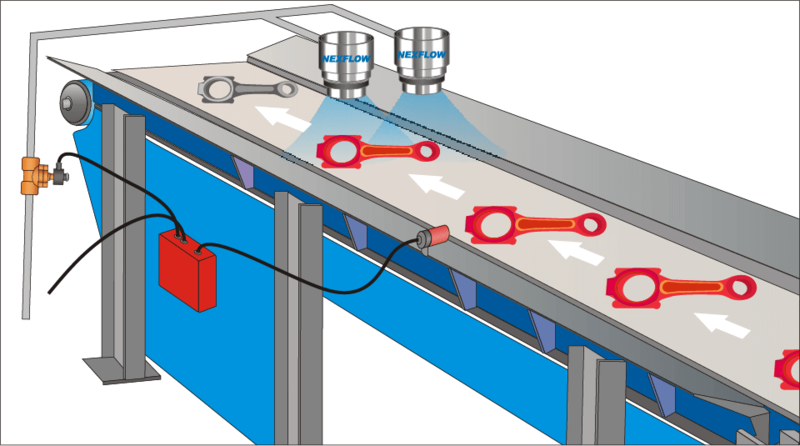 The air turns off 2 seconds after the castings have passed – an ideal “Plug and Play” solution to save compressed air. The PLCFC combines a photoelectric sensor to turn on the air when the target passes the sensor and to turn off the air when it leaves the sensor. (The unit is set to have a 2-second delay after it leaves sensor but turns on instantaneously when it sees the target). In one example using an air knife, compressed air enters at point (A) into air knife (B) only when the sensor (C) sees the target. The PLCFC is located at point (D). The target part (E) passes the sensor activating a solenoid to turn on the air flow to the air knife. The target travels on the conveyor (F). Two seconds after the target has passed the sensor, the air supply is turned off conserving energy. Different sensors are available for different applications and the units can be programmed for special applications.